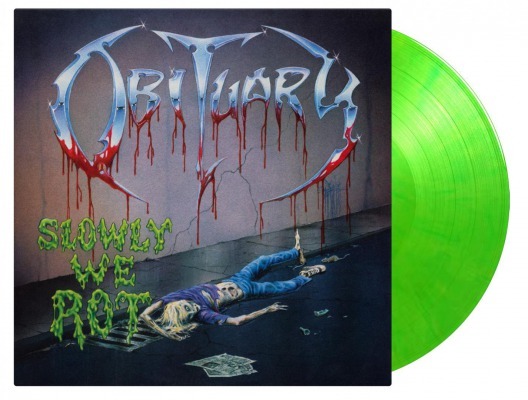 OBITUARY - SLOWLY WE ROT COLOURED VINYL (LP) | Online Shop | Wizard LTD. Album: "SLOWLY WE ROT COLOURED VINYL (LP)"
Obituary’s death metal debut album Slowly We Rot was a ground-breaking release at the end of the 1980s. As one of the pioneers of this genre they created a heavy album where everything was monstrous. From their down-tuned guitar riffs, deep growls and moans and distinct tempo changes. The songs are often slowing down to a doomy tempo, a revolutionary thing at the time of release. Slowly We Rot is inspired brilliance, where the meaning of the title is illustrated in the music and lyrics. Overall, you’re in for one hell of a package with this album, as this is the true classic from the death metal. The Floridian death metal band Obituary is one of the most successful death metal bands of all time. With the exception of their 1997-2003 split, they continue to perform live around the world.